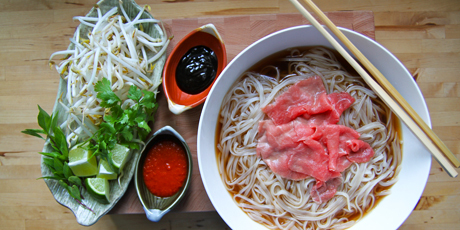 Pho is the Vietnamese interpretation of the French “pot au Feu,” a broth-cooked stew of meat and vegetables. The Asian version is rich in fragrance and has a fresh kick to it: some of the elements are added at the table right before eating. 1. For the broth, heat a soup pot on high heat. Sear the onion, flat-side down until dark brown, turning occasionally (this will add a smokiness to the broth). Add the ginger, spices and beef stock and bring up to a simmer. Simmer, loosely covered, for 15 minutes. Strain and return the broth to a simmer. 2. While soup is simmering, arrange assembly ingredients on plates or a platter.